First CD/DVD loading robot designed to automate computers, manual duplication towers or printers, no matter the number of drives. Our patented floating picker solution enables fast free-of-error operation and vertical disk travel up to 80 cm (over 30 in). The picker flexibly self-adjusts its position to the center of the disc and grips it securely from beneath, ensuring high reliable single-disc pickup. Problems commonly encountered by other disc-picking devices (such as picker-to-disc misalignment, disc dropping during transport or double-disc pickup) are completely eliminated. Fast. Average disk changing cycle less than 14 seconds (unloading + reloading a tray!) when automating a regular desktop computer or a 8 drives manual duplication tower. Even faster on smaller towers. Easy to use. Single button operated with intuitive menus. Easy to install. The robot is simply placed on the top of the tower/computer. The robot itself guides the user through the alignment procedure. Flexible number of bins. The user can choose to work with minimum 2 and up to 8 CD/DVD bins, placed close around the tower/computer, up to 4 on each side, depending on the number of disks to be processed. The disc-bin positioning procedure is conducted by the robot itself and takes about 20 seconds for each selected stack. 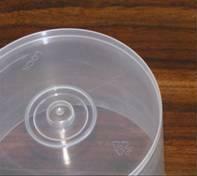 Regularly, the original 100 CD/DVD plastic packages can be used as bins, allowing up to 600 disks to be processed unattended. Capacity can be multiplied by using larger (custom) bins. Self management of bins. When used to automate Wytron duplicators, the robot "knows" by itself where to bring the blanks from and where to deliver the processed disks to, acting pretty much like a human operator. Insensitive to external aggression. Whenever the arm is accidentally obstructed, the robot will resume its job without failure as soon as the aggression ceases. RS232 link ready. Works with all Wytron duplication controllers. Can be controlled by custom applications, too. Silent, small, lightweight. About 2 pounds (1kg). Low power consumption (6W). Feed by external 12-15VDC unregulated power supply. The package containing Dexterix is 18"x14"x6" and weights 10 lb. Inside the box you will find: the robot, the RS232 module/cable (if not already installed inside the tower), the positioning drum, eight bin-supporting rings, eight spacers, the power supply and the manual. The bins are not provided. Regular disc packages (“cake boxes”) are to be used. This electronic module/cable assembly is the interface between the Wytron controller and robot. The DB9 (RS232) connector should be installed at the rear of the tower, while the other end should be connected to the controller’s COM2 port. When Dexterix comes bundled with a duplication tower as a complete duplication system, the module is already installed inside the tower. When Dexterix is being controlled externally from other applications and not by a Wytron duplication controller, this module is not necessary. 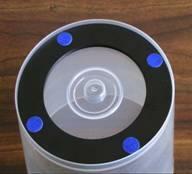 This 8cm diameter device is used during the interactive bin positioning procedure. The robot picks it from an open drive-tray and delivers it precisely to the location where the bin is to be positioned. Eight such rubber foam spacers come with each robot, one for each bin. The bottom of the bins (“cake boxes”) must fit and mate with the bin-supporting rings, which are 121mm diameter. The bottom of the bin should look like the one in the picture.